Rugby Australia has officially issued Israel Folau with a notice of termination following his controversial social media post last week. The 30-year-old Christian shared a graphic on Instagram that stated that ‘hell awaits’ homosexuals and those guilty of other ‘sins’. Folau has 48 hours to respond to accept Rugby Australia’s sanction, or have the matter referred to code of conduct hearing. ‘At its core, this is an issue of the responsibilities an employee owes to their employer, and the commitments they make to their employer to abide by their employer’s policies and procedures and adhere to their employer’s values,’ Rugby Australia said in a statement. ‘Following the events of last year, Israel was warned formally and repeatedly about the expectations of him as player for the Wallabies and NSW Waratahs with regard to social media use, and he has failed to meet those obligations. It was made clear to him that any social media posts or commentary that is in any way disrespectful to people because of their sexuality will result in disciplinary action. 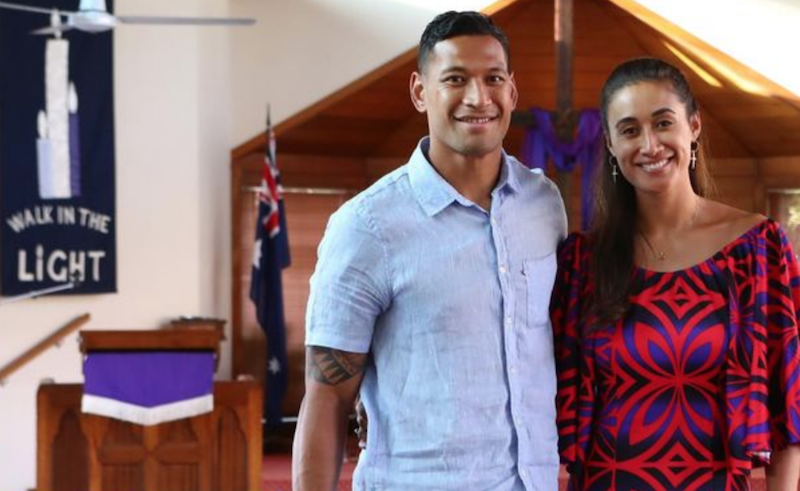 On Sunday, Folau spoke to the Sydney Morning Herald at his Sydney church and said he did not regret his post. ‘Absolutely not. I’ll stand on what the Bible says. ‘I share it with love. I can see the other side of the coin where people’s reactions are the total opposite to how I’m sharing it. Folau said he would ‘absolutely’ be content with a life away from rugby, although he admitted he would miss it. ‘First and foremost, I live for God now. Whatever He wants me to do, I believe His plans for me are better than whatever I can think. If that’s not to continue on playing, so be it.